Did you know there are one million hedgehogs in Britain? Seems like a lot right? YOU’RE WRONG! That’s 300,000 less than there were a decade ago. 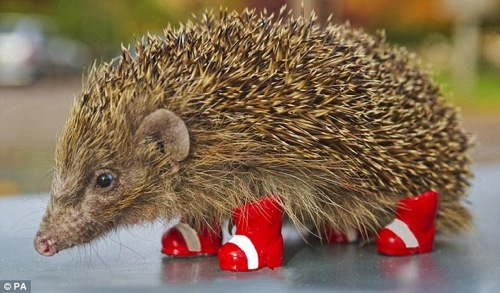 Sega has teamed up with People’s Trust for Endangered Species to bring awareness to the decline of the spikey lil’ guys buy dressing them up in cute Sonic boots and creating a ‘hedgehog road crossing’ in Twickenham, London, which happens to be Stevie Grant’s hometown! Stevie, get out there and help those hedgehogs along there way. Also, promotion for Sonic Colors is occurring. Sega totally screwed up though, Sonic only wears two boots. And he’s blue! Geez, I bet they mucked up the physics too.